This is the most advanced and most dangerous of the boigine or rear- fanged snakes. The posterior teeth are grooved and enlarged into fangs that receive very potent venom from a true venom gland. The snake is also able to rotate the tooth-bearing bone so that the fangs are brought into striking position. The venom is very effective on warm-blooded prey, and several human fatalities have been reported. Ranging widely over the African continent, these 6-foot snakes are often mistaken for mambas but are quite dangerous in their own right. When frightened or disturbed the Boomsiang inflates its neck, puffs itself out, and strikes at the intruder with open mouth. 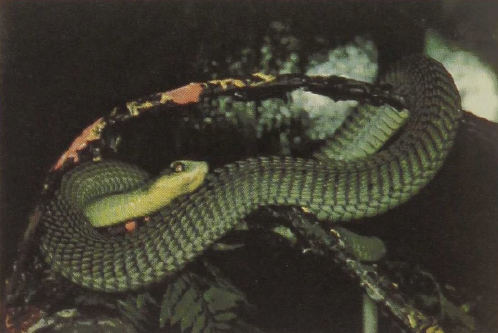 The Boomsiang is a tree snake traveling by undulation through the rough branches of thorny trees, where it normally hunts birds.